Nestled among the hills of the Staffordshire Moorlands, in the United Kingdom is a pretty remarkable place. A mini mountain that has gained recent notoriety through platforms such as Instagram. With budding photographers, eager to (not only) conquer this beautiful looking hill, but in the hope of capturing something unique and inspiring, for all to see. If you blink, you'll miss it and if you are not sure how to find it, well... you probably won't. If you intend using a map, you're not likely to find any visible route to guide you to the top. I have seen one or two sign posts, but most are old and weathered, or simply facing the wrong way. Therefore, I consider all these elements just add to the interest and excitement and if you do manage to find it, then you certainly won't be disappointed. Each time I visit this place, it feels more and more like home. Each time I visit here, I'm somewhat captivated by the overall beauty that surrounds it. It is located as an extension of the Peak District, the Staffordshire Moorlands, my childhood home and the views from the top, pretty much help to capture its ruggedness and splendour in a very satisfying way. One of my favourite walks, starts at a favourite pub, The Quiet Women. Which is located in the small village of Earl Sterndale. Again, nestled among the hills. Stepping into this place (the Quiet Women) is like stepping back in time, when the village was at the centre of the local community and pretty much, the life and soul of proceedings. From the outside, the pub doesn't look the most inviting. In fact, it very much reminds me of that scene from the cult horror classic, 'An American Werewolf in London'. Where the two hapless souls (right), wandering the countryside and moorlands of North Yorkshire, venture into the rural pub called the 'Slaughtered Lamb', but only to their inevitable peril. As they walk inside, what life there is, suddenly stops, silence ensues and the strangers soon become the most interesting thing seen for quite some time. With that said, the pub is very in-keeping with the surroundings and inside, the decor certainly has an authentic rural feel, complete with open brick fireplace and tiled floor. The beer is good and the hospitality is excellent too, with friendly locals and other walkers frequenting. Setting my humour aside, the Quiet Women is a very welcoming place and any visitor is really made to feel at home. The pub is a good place to start and finish the walk. From here you venture out of the back, through the gate and then off, on your way. Once you have gone this far, the route begins to open up and the paths gently wind on towards the undulating slopes of Parkhouse Hill. I like Parkhouse Hill as it is not only a unique landscape feature by itself, but it is also the smaller version (little brother or sister) of the more dominate Chrome Hill, that lies in the distance. They conveniently stand one in front of the other and walking up one, will then lead to walking the other. It is that straightforward, one after the other. Parkhouse Hill rises up and is quite steep in parts with outcrops of Limestone often making it slippy underfoot. Wear good shoes with grip, as the tricky terrain and steep sides can often lead to a feeling of instability and sometimes vertigo, in certain places. Also, take it steady, on the climb, as once you stumble or even fall, there is probably very little to stop you before you actually reach the bottom. Thankfully, it has never happened to me yet, but it is good to err on the side of caution, as these things often happen when you least expect them to. At this stage in proceedings, it probably sounds like you are setting out and attempting to conquer the summit of Everest. Obviously, that's not entirely true, but experience tells me that, in many walks of life, looks can indeed be deceiving. What a great view it is. Looking back towards (the smaller) Parkhouse Hill, as you slowly climb up the steepest part of Chrome Hill. Once at the top of Parkhouse Hill, the views are plentiful, with the view towards Chrome Hill being pretty spectacular and as you begin to move closer you can make out the profile and unique geographical appearance of the 'Dragons Back'. This symbolises the very top of the hill, with an obvious explanation being... its profile looks more like a Dragons Back. If they do actually exist?! Descending the hill can also be tricky at times. Again, it can be slippy, as it rains quite a lot here, with plenty of rain falling throughout the year. Therefore, this area is not called the Moorlands for nothing, its the earth's natural sponge. Nevertheless, regardless of weather conditions and natural features, keep walking forward and your focus should be looking towards the next hill. That hill being... Chrome Hill. Chrome Hill is a really beautiful hill and pretty unique. It is nestled at the bottom of a high sided valley and can only be seen once you are almost on top of it. A great viewing point can be seen from the B5053 road, near to Jericho Farm. The climb up to the top is fairly steep and again challenging in parts and in several places, it can become very exposed to nature, with the wind sometimes becoming hazardous. Although I have to say that every time I've ventured up here, it has always been pretty kind to me and been a very satisfying experience, even if the weather does turn out to be rubbish at times. During this walk and from the pictures taken on my Smartphone, the weather was pretty drab, with grey skies and blustery winds. Once you have navigated the majority of the uphill climb, you soon approach the top and begin to reach more rugged rocky outcrops, with jagged Limestone crags visible from out of the underlying soil. It is exposed here and sometimes challenging underfoot, but it is well worth the effort, as the views are really stunning with memorable views are all around. On a clear day, from here you can see right across the Peak District in all directions. Into the Derbyshire Dales, Staffordshire Moorlands and the Dark Peak beyond. On a bad day, you'll need to hang on, as the wind whistles across the landscape all around and it can be rough at times, testing your nerve and willpower to reach the top and stay there for that selfie. Click!! Once you reach this point, there is nothing better than stopping, snapping a few pictures or just simply revelling in your achievements. The lush green landscape that surrounds is hard to resist and it's hard not to capture a good shot that's worth viewing time and time again. It is also pretty unique to listen to the sounds that are all around. It is not very often that we find 'silence' or at least the closest thing to it. Here you might just do that and watch sound you do here are probably from the sheep, cows or a plane on route to Manchester airport. After taking several 'selfies' I tend to then walk down the farthest side of the hill, the side that looks in a westerly direction towards Axe Edge, which lies in the distance and I begin to make my way back to the lower levels of the hill. Again, here it is breathtaking and if you look back you're simply immersed with stunning views of the entire hill and the picturesque landscape beyond. The rugged, exposed landscape that can be seen in the distance is another fabulous area known as the Roaches. Here you'll find some great circular walks, challenging terrain and a stunning landscape, that in the right light is simply unmissable. From here I tend to walk towards and then link up with the small country roads that are so prevalent in the area. These roads are narrow and winding and play an integral part when linking one village to another. I will eventually follow the roads back towards where I had started, the pub at Earl Sterndale. The route is winding, downhill and good conditions underfoot. From here on in and towards the valley floor you'll still manage to view some really breathtaking views of the surrounding countryside and pastures filled with dairy cattle. I particularly like the little path that runs alongside the hill and back towards Parkhouse Hill. It is a quiet route, well apart from the sheep, but the stream next to the path helps to make all photo opportunities, pretty photogenic. Another possible route down to normality is a route close to an area called Dowel Dale. Here there is a narrow steep sided gorge. It is only a short section, but its appearance is fairly dramatic and I personally think it looks more like the smaller version of Winnats Pass. Which can be found some distance further, in the Dark Peak area of the Peak District. Here you'll find a popular walking area, that is popular with all manner of visitors and would be adventurers wanting to capture the same shot everyone else. Sadly, from time to time I have also fallen foul to wanting these same images. It is just a shame it has been over photographed or roamed on far too much. Anyway, enough of my policing of the Peak District... Here (back to Chrome Hill) you can walk the smaller road towards the isolated farm at the very bottom of the picturesque valley. The sides of the gorge are very steep, with trees and sheep seeming to clinging to the side, like their lives depend on it. Around half way down there is a little variation to the walk, as you can take the track and footpath to the left, which effectively takes you over Parkhouse Hill or continue straight on to almost where you started. It takes you passed an area called Glutton Bridge. I always prefer the challenge, therefore I take the more strenuous option, so I decide to go left. It's a short, steep section that gets your heart beating for sure. Once at the top though, it opens out and again the views are quite stunning. 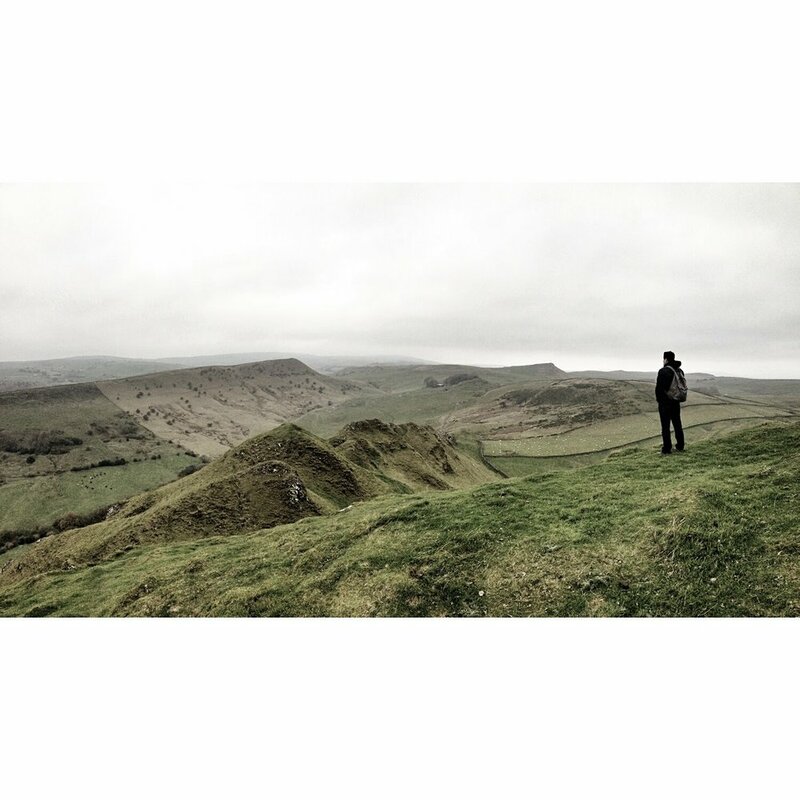 Personally, I think it offers another great spot for a photo, as both Chrome Hill and Parkhouse Hill come into view. From here, I then wander across the fields and onward towards the road. I turn right at the small road and make my way to Earl Sterndale, which is visible in the distance. It is definitely a welcome sight and the appearance of the starting point means that you can visit the pub once more and get yourself a well-earned pint of beer, a pie, bacon sandwich, a cup of tea, or if you're like me... all of them. for reading this. It is my first blog entry about a favourite walk of mine and an equally glorious spot found in the beautiful surroundings of the Peak District National Park. This is one of my favourite locations found so close to my childhood home. Due to me spending most of my life in the outdoors, I do hope to follow my passions even further and focus a little more on this kind of thing. I will be back home in the UK in the next few weeks and will undoubtdley be spending most of those days in the great outdoors. Therefore, I intend to continue adding content and developing it, so that it appeals to like-minded souls who simply share the same passion as me. Furthermore, I hope my own personal style and outlook on life encourages and motivates others to follow their passions too. No matter what you are doing or where you are doing it... Just get out there and explore!